In a recent oped  (PDF) in The Australian I drew attention to China’s distant water fishing fleet; it’s now the world’s largest  and is heavily subsidised. China’s rise as a fishing power is linked to its geopolitical aspirations  (PDF). The Chinese Bureau of Fisheries in the Ministry of Agriculture has a distant water fishing subdivision  (PDF). China has extended its number of fisheries access agreements with coastal states. More than half the catch is transported back to China, with high-value species sold abroad. China also plans to develop non-traditional fisheries such as Antarctic krill. A third of China’s distant water fleet is composed of a large state-owned enterprise, the Chinese National Fisheries Corporation, and its subsidiaries. The rest of the industry is composed of regional middle-sized companies and small coastal companies. China’s distant water fishing operations are rapidly expanding , and its fleets are rather poorly regulated. China uses its fishing fleets to create a strategic presence  in both the East and South China Seas ; this also helps China’s navy by developing knowledge of local conditions. But China’s fishing fleet expansion offers opportunities for other states to cooperate with China on fishery matters. Nowhere is this clearer than in the Western and Central Pacific Ocean, which produce 60% of the world tuna stocks. The latest fisheries stock assessment shows that the sustainability of some of the tuna stocks in the Pacific region are at risk . China has aggressively increased vessel numbers in the region and those vessels remain largely based on the high seas. But it doesn’t have a great record of providing data that properly identifies species and attributes catch to the correct country of origin. (Japan, by contrast, continues to set a positive example  to other distant water fishing nations licensed to operate in Pacific waters when it comes to regional compliance standards). Australia can help China develop good data collection systems, especially electronic reporting systems. Fisheries are one of the most significant renewable resources that Indian Ocean countries possess to secure food supplies, maintain livelihoods and assist economic growth. Indian Ocean fisheries produce around a third of the world‘s tuna and include the valuable southern bluefin tuna (SBT) fishery. In the Indian Ocean, China has been rapidly expanding its tuna fishing, with poor reporting of catches. But regional fishing bodies in the Indian Ocean have only policy recommendation functions, meaning it’s up to the individual states to implement measures to manage fisheries effectively. As an Indian Ocean littoral state we’ve got a direct interest in the sustainability of the region’s fisheries. The Indian Ocean contains the spawning area for southern bluefin tuna; our most valuable tuna fisheries have current exports of $150 million per annum. China remains outside the SBT Commission and this presents a problem: China has a large number of boats fishing in areas where southern Bluefin tuna is caught. 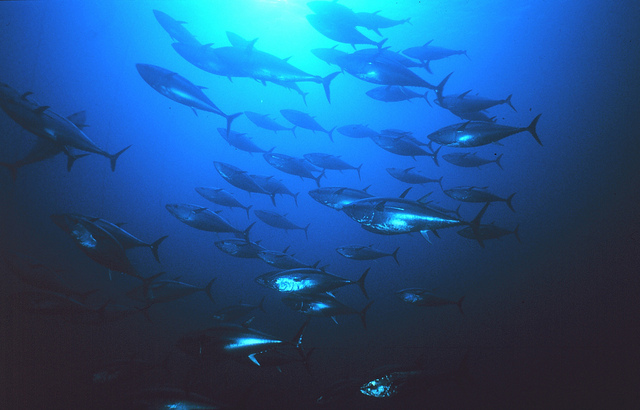 Studies of China’s markets have identified southern bluefin tuna present in this market. Australia should encourage China to accede to the SBT Convention and join the relevant fisheries management organisation —the Secretariat is in Canberra—as a full member. More generally, we should encourage exchanges between Chinese fisheries’ scientists and our fisheries’ scientists and managers. We should include fisheries’ issues on the agenda of our annual high-level bilateral strategic dialogue, and use this to strengthen links with China in the Indo-Pacific. Anthony Bergin is deputy director at ASPI. Image courtesy of Flickr user U.S. Fish and Wildlife Service Headquarters. relevant fisheries management organisation: http://www.ccsbt.org/site/%203.